1) (France). Az. a sinister bend ar. betw. two stars of the last. 2) Or, a fesse indented erm. betw. three pomegranates leaved ppr. Crest—An arm couped at the shoulder, vested gu. resting the elbow on the wreath, the hand towards the sinister, holding a bow ppr. 3) or Barry – (Scotland). Az. an eagle displ. ar. surmounted by a fesse(another, a bar sa. charged with two mullets of the second). 4) (Worcester, 1825). Az. an eagle displ. ar. surmounted of a fesse sa. charged with two mullets or. Crest—A lion’s head erased gu. gorged with a collar or. Motto—Fortitudine. This popular Scottish, northern Irish, Norman-French, and English last name developed as a habitational name denoting a person who was from one of various towns and villages through Britain named Barr. 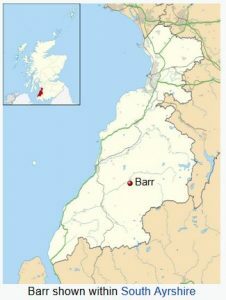 There are two main locations named Barr in Scotland: one in Ayrshire and one in Renfrewshire, derived from the Gaelic or Welsh word barr, or Celtic word barro, meaning “height or hill”. There are various placed named Barr in northern France, such as Barr-en-Ouche and Barr-de-Similly. There is a town called Great Barr in West Midlands, England. A second theory is that, in England, it is a topographic surname denoting someone who lived at or near a barrier or gateway, from the Middle English and Old French word barre, meaning “bar” or “obstruction”. In France, of Norman origin, Barr may have developed. Third, it may have developed as a metonymic occupational name for a maker of bars or poles. Fourth, in Ireland, it may have developed as an Anglicized version of the Irish surname O’Bairr or O’Baire. Still others believe the name has Old Norse, Danish, or Flemish etymological roots. Elsdon Smith Coles, in his 1956 book Dictionary of American Family Names, offers the following meaning: “Dweller at the sign of the bear; one thought to possess bearlike qualities. The bear was the king of beasts in the north of Europe”. Spelling variants and names with similar etymologies include: Bar, Barre, Baer, Baerr, and Baer. The only Barr family motto I was able to identify is Fortitudine, which translates from Latin to English as “With fortitude” or “Might”. The first known bearers of this surname was Richard de Barra, of Somerset, who was documented in the Domesday Book of 1086 AD, a survey of England and Wales ordered by William the Conqueror. Hugo Barr was listed in the Danelaw documents for county Lancaster in 1155 AD. However, a Ralph Barre is claimed to have been documented in England two years earlier in 1153 AD. William de Barre is recorded in the Assize Rolls of Stafford in 1199 AD. The Hundred Rolls of 1273 AD, a census of Wales and England, known in Latin as Rotuli Hundredorum lists two bearers of this surname: Gunilda de la Barre (Hertfordshire) and Philip de le Barre (Huntingtonshire). John de la Barre was documented in Staffordshire and William atte Barre was recorded in Derbyshire, both around 1292 AD. Albyn de Barr was the baillie of Ayr, Scotland in 1340 AD. John Bar of de Barre was a burgess of Edinburgh, Scotland in 1423 AD. The Magni Rotuli Scaccarii Normanniae lists several bearers around 1190 AD: Gerard, Geoffry, Peter, Ralph, and Tiger de Barra. The last name Barr ranks 738th popularity in the United Status as of the 2000 Census. The name ranks particularly high in the following five states: Pennsylvania (290th), Alaska (318th), West Virginia (372nd), Nevada (397th), and South Carolina (406th). The surname Barr frequency/commonness ranks as follows in the British Isles: England (820th), Scotland (149th), Wales (1,430th), Ireland (996th) and Northern Ireland (125th). In England, it ranks highest in East Riding of Yorkshire. In Scotland, the surname ranks highest in North Ayrshire and Renfrewshire. In Ireland, it ranks highest in Ulster. In Wales, it ranks highest in Conwy. The name is also present throughout the remainder English speaking world: Canada (815th), New Zealand (434th), Australia (491st), and South Africa (9,834th). 1) Benjamin M. Barr was born in Lancaster, Pennsylvania in 1796. He married Mary, daughter of Martin Mylin and Elizabeth Buchwalter, and had the following issue with her: Catherine, Ann, Benjamin, Maria, Elizabeth, Magdalena (Martha), Frances, and Barbara. His son Benjamin was born in the same town in 1823. He married Barbara Groff and had issue with her as follows: Mary Ann, Susan, Samuel, Emma E., Catherine, Frances, Benjamin, John, Barbara, Anna, Sarah Ellen (Saddie), Enos, and Abraham. 2) Samuel Barr was born in Marietta, Lancaster, Pennsylvania in 1793. He married Maria, daughter of John Stauffer and Anna Herr, and had the following children with her: Catherine, Ann, Benjamin, Maria, Elizabeth, Magdalena, Frances, and Barbara. John Barre was born in Berkshire, England c. 1530 AD. In 1556, he married Annis Ottes in Berkshire. They had a son named John. This son, John Barre, was born in Lancashire, England in 1554. He married twice: Emmott Goye and Edye Winterbourne. He came to colonial America. He had two daughters: Marie and Elizabeth. Edward Barr was born in Lockton House, Hawnby, North Yorkshire in 1639. In 1665, he married Margaret Flintoff and had four issue with her: Oliver, William, Dorothy, and Edward. His son, Edward Barr, was born in Hawnby, England in 1672. He married Ann Flintoff and had four issue with her: Ann, Bryan, John, and Edward. 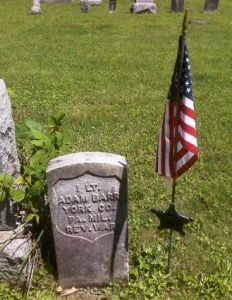 His son, Edward Barr, was born in the same town in 1718. He had a son also named Edward who was born in Hagg House, Kepwick, England in 1760. He had a daughter named Mary. John Barre was born in Flatbush, New York in 1673. His son, James was born in 1708. James had a son named John. John was born in 1740. He had a son named Amos. Amos Barr was born in Sussex, Delware in 1779. His son, John Barr, was born in Marion County, Ohio in 1826. He married Mary Elya and had a son with her named Fleming. Fleming Barr was born in Greenfield Township, Indiana in 1852. He married Ella Frances Freligh. Their son, Frank Arthur Barr, was born in LaGrange, Indiana in 1885. He married Huldah Adelle Wilber and had a son with her named Ralph. This son, Ralph Wilber Barr was born in Indiana in 1909. He had issue. He passed away in Rochester Hills, Michigan in 1983. 2) Roseanne Cherrie Barr (1952) is a Jewish-American actress and comedian from Salt Lake City, Utah,, best known for her role on the hit television sitcom Roseanne that ran from 1988-1997. 7) James Mark McGinnis Barr (1871-1950) was an inventor, electrical engineer, and physicist who is known for proposing the notation for the golden ratio. Big up the Barr family.